The Black Forest Inn: Spaetzle! Spaetzle literally means "little sparrows". 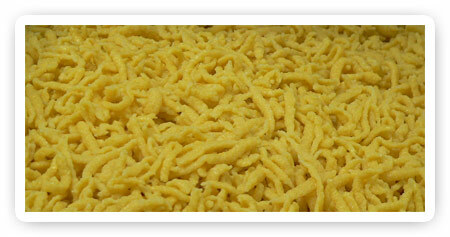 Spaetzle are originally from the Baden-Württemberg area of Germany. Spaetzle are technically little dumplings, though most people refer to them as noodles. Spaetzle have been called "the potatoes of Württemberg" because they are ubiquitous on the table and in recipes. In many places in Baden-Württemberg a bowl of spaetzle and a salad is considered a meal (many of our customers feel the same way)! 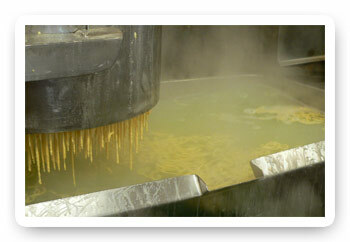 The thick batter of egg, flour and water is dropped through a sieve and the little squiggles are boiled in water. Alternatively, they can be made of soft dough and cut quickly on a board held over a pot of boiling water. This method is more common in Baden-Württemburg; the sieve method is more common in Bavaria. Sometimes chicken stock or a pinch of tumeric is added to the water give the spaetzle a slightly yellow color; we do not do this. 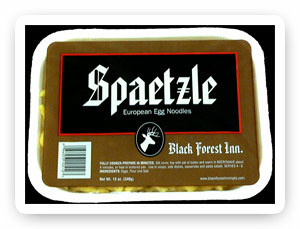 Convenient 12 oz boxes of frozen Black Forest Inn Spaetzle are sold at many grocery stores in the Twin Cities, western Wisconsin and Des Moines, Iowa. The box is oven and microwave safe. The noodles heat quickly and make a great accompaniment to any meal! Look for this box the next time you are shopping. 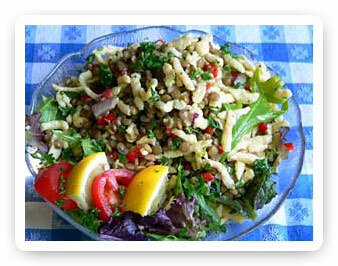 If you don’t see it, tell your favorite grocery store how much you’d like to buy our spaetzle there! If you would like to order a spaetzle in bulk (ten or fifteen pound bags) or large quantity of spaetzle in boxes (sold in multiples of twelve), please contact us at the restaurant. Try it as a side dish, in a soup, a casserole or a salad. Try some deep fried spaetzle—mmm, tastes like the state fair! Just have a bowl with some butter for a little comfort food! P.S. Kids love it! Once you are familiar with our spaetzle, you’ll have dozens of your own favorite ways to enjoy it! Serve on a bed of mixed greens. Try it with a green salad on the side for an easy meal. accompaniment to your favorite entreé. or any combination of fresh vegetables.